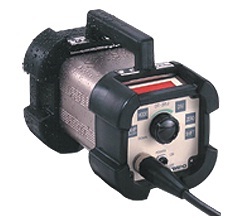 DT-311J stroboscopes – designed for harsh and wet work areas. Where powerful illumination and rugged speed measuring accuracy are required for the textile industry, the DT-311J will perform where other stroboscopes will not. Rugged-Drip Proof (IP65) Housing, High Performance Accuracy, Special Phase shifting, w/ Shock Absorbing components and top mounted handle, allows the equipment operator maximum flexibility when setting the timing of weaving machinery.